A great high quality Brazil coffee is soft, nutty, low acid, with nice bittersweet chocolate tastes. It is also quite an exceptional base for making flavored coffees because of it's softness in the cup. Brazil is a coffee giant producing over 40 percent of the world's coffee! Most of this is lower grade arabica and even lower grade robusta, but there are some special Brazilian coffees out there, and if you ever have had an espresso or cappuccino, there is a great chance you have had a Brazilian coffee before. Why does Brazil produce so much coffee, yet so much of it is not speciality grade? Two reasons: Coffee is a major agricultural crop in Brazil, and thus economies of scale rule here, not quality of the cup, per se. 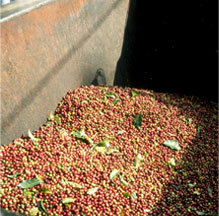 Many Brazilian coffees are mechanically stripped from the coffee tree, not lovingly hand picked. This mechanical picking results in many less-than-ripe cherries taken off the tree. Another factor in Brazil's coffee is altitude, or lack thereof. 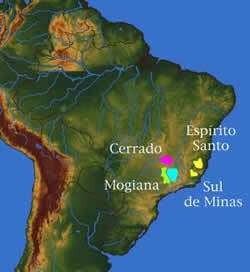 Much of Brazil's coffee is lower grown in grassland areas in non-volcanic soil. These conditions are less than ideal for specialty coffee and this comes through in the cup. Okay, okay, so if things are not that great in Brazil, then why do they grow 40 percent of the world's coffee? Well, the answer is twofold. Most of the coffee in Brazil is grown to be "commercial" grade coffee that goes into those little metal cans, and into instant (soluble coffee in the trade), and into other uses that are similar, so that peak flavor is not a concern, but rather bulk and price are the prime considerations. The other is that there are some very good Brazilian coffees. A great high quality Brazil coffee is soft, nutty, low acid, with nice bittersweet chocolate tastes. A good Brazil coffee can add a lot to espresso blends, and is great straight! One of our consistent favorites is a natural Brazil, where the coffee is laid out to sun dry with the cherry on. This imparts a rich dry fruit flavor onto the coffee bean, and adds to the body of the cup! So in summary, there are some very good Brazilians out there. So we cup and cup to find those that are special and pick them out of the rather large crowd of humdrum (or so-so) Brazilian coffees. Introduced: Seeds brought by the Dutch from Java to the Botanical Gardens of Amsterdam where sent to Surinam in 1714, and then the French brought them to Brazil a few years later. 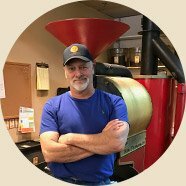 Visit: Lakota Coffee Company Home Page.